2. While the chicken is rocking on a low heat. Mix up a half bottle of your bbq sauce along with the remainder of the ingredients. 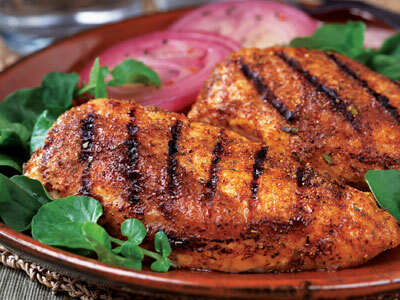 This will become your incredible chicken glaze that creates the best bbq chicken. 3. Grill the chicken for 10 minutes on the skin side until you get nice color and the chicken skin begins to crisp. flip and cook for another 20 minutes until the chicken is cooked or a meat thermometer inserted near the bone reads 165 degrees. 4. Baste with the delicious glaze and and cook for another 3 minutes. Let the tangy spicy sauce get inside the meat. Do not be afraid to dip your chicken in the remaining glaze.